We already have had different concepts about how the festival of colors is celebrated. Even at Velocity, we have had a tradition of painting the world red or even in the past years of our experiences, we have seen the traditions grow with time. We always had a buffet lunch at work with activities that were Holi-specific. However, this year came with a groovy celebration that was practically the best celebration that the Velocitians have had. 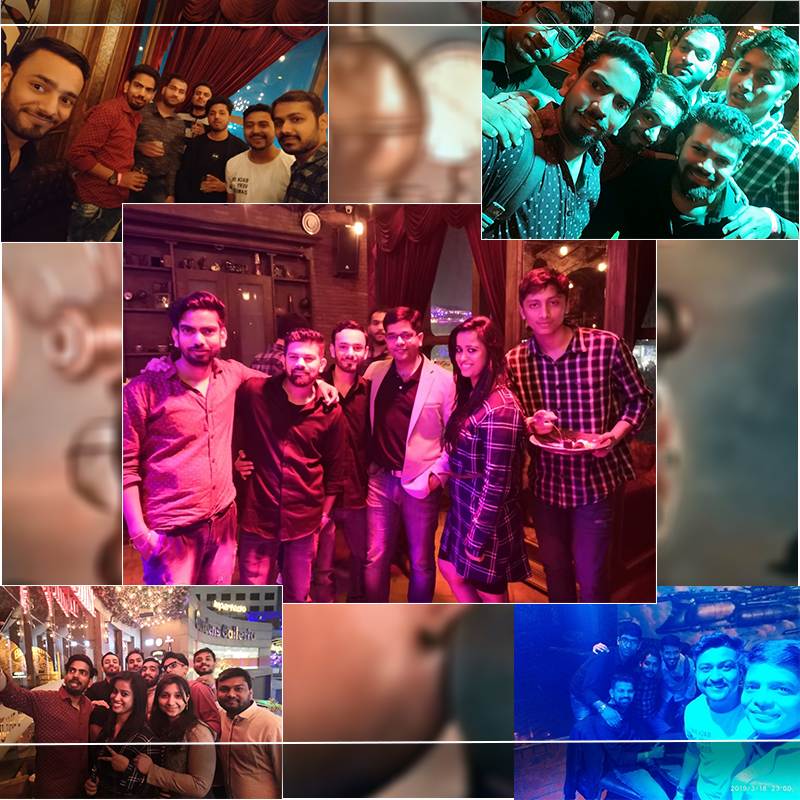 The party and the celebrations were moved from the office premises to the Time Machine, The Time Traveller’s Pub, Noida. 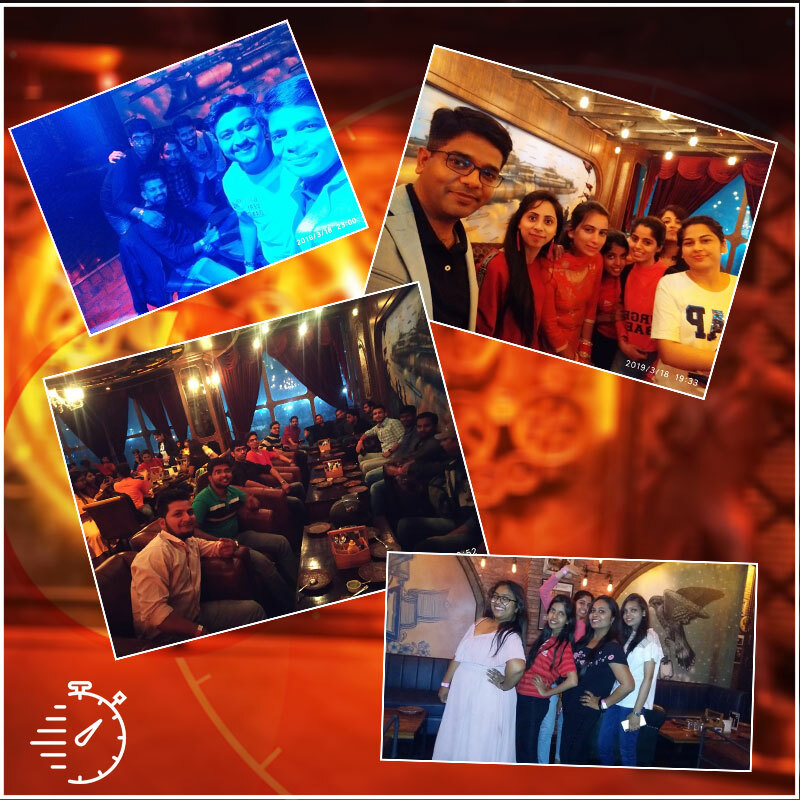 Well, in itself was like a fantabulous experience that gave an opportunity for all the employees and the management to come together and have a good time together. It was a secret affair (like it always is) till the mail was dropped in everyone was just talking about it. The dinner was planned on a Monday which again was intentional to make the Monday-blues go away. The company believes in spending big and small moments of joy and happiness with its employees. It has organized small events from time to time to acknowledge the active participation, enthusiasm and strong work culture of its employees which has together catapulted it into the company to reckon with. Well, this was something that was on a bigger platform and as lavish as it could be. As we left from work at 6:45 in the evening carpooling and sharing the vehicles of the others, we all were overjoyed. Well, we left late because the women category was busy getting decked up for the occasion – I am sure they deserve to look glamorous on a Monday evening for sure. Smartly dressed, we reached and made ourselves comfortable in the dining area. And the starters started to come in. That was one amazing time when we started to hog on the best of Dry Chicken Manchurian, Fish Manchurian, crispy chicken wings, chilly potato, Veg Shammi kebabs, and so much more. We were practically starving because we had to fill our stomachs there. The taste and flavors were amazing. Then came in the mocktails and the booze. You know what you want – go ahead and get the same made by the bartenders attending to your needs. Who thought this would be possible? Well, then we started dancing!! All the peppy numbers playing, we saw a lot of dancers setting the platform on fire with their stunning moves. We all danced for a few hours and then the food was served. The main course of the dinner was even more lavish. We had butter chicken, fish curry, mutton gravy with a series of exotic loaves of bread and rice as well. To top it off on a sweet note, chocolate brownie with ice-cream was served to everyone. It was a fab evening for one all where the bosses and the employees were friends and the celebration was more of a family-kinds. 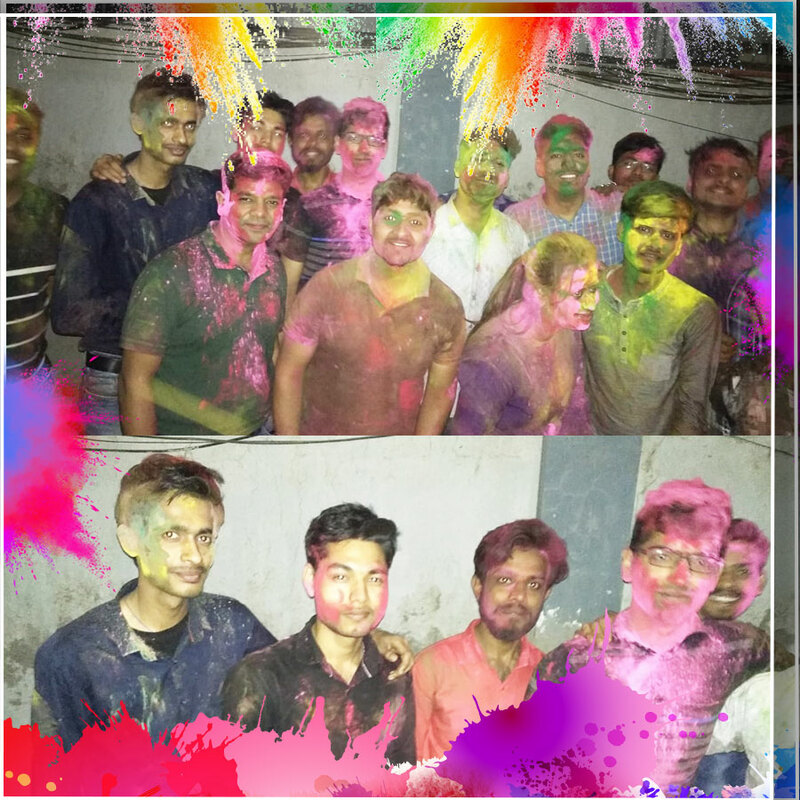 Well, we might have had our share of good food, dance, and enjoyment that evening, but that’s not what Holi is all about. Well, the following Tuesday we also played colors at work with the customary gujiyas served to all. It was indeed a happy, groovy and twisty festival of colors this year. Thanks to the management for organizing a memorable evening for us all! !